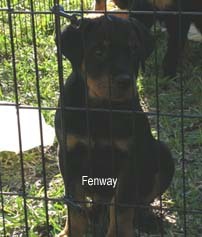 Sponsor 1: Nine year old Jordan Wheeler of Eastham, MA is the puppies first sponsor. She asked that her birthday money be donated to Save A Dog for the hurricane Katrina dogs. She raised $150 and her parents matched it so the total donation was $300. We are just so touched that a nine year old could be that thoughtful. Foster Home Location: Southern Florida. Temps currently 60's at night and 70's during the day. 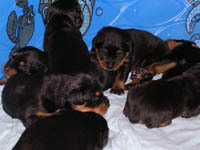 Saturday 12/31/05: Sonja and the puppies made it safely to Massachusetts yesterday. 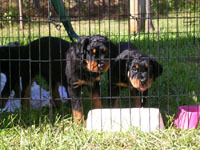 Many many thanks to Tara and Scott for their long hard days of driving while tending to the pups needs. They are now in an approved quarantine facility where I know they will be well taken care of and get lots of attention until they move on to their forever homes. It was a lot of work taking care of them but I miss every one of their cute little faces and even their little antics that kept me laughing. Sunday 12/25/05: Merry Christmas! 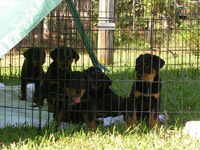 The Puppies are now 9 weeks old and are growing like weeds. 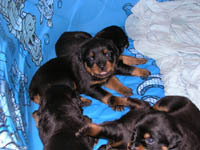 Last week I weighed them - the littlest girl was 10 lbs, the largest male 15 lbs and the average of the others was about 14 lbs. They love to be outside so much that they stay out most of the day now. They play and rough house with each other a lot more now. They are learning certain things too fast - I use to be able to sneak out onto the front porch but now they know when they hear my dog's tags I am not too far. They also know the sound of the dog food being poured into the dishes. 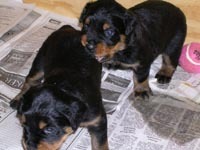 The puppies learned quickly not to nip at my hands. If they tried I simply removed my hands from petting them and they get the picture pretty quickly. All of them will now lick my hands. 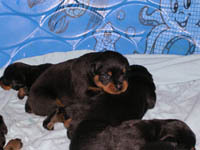 Monday 12/05/05: Puppies are 6 weeks old. 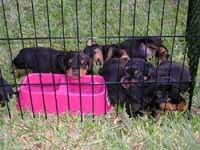 They have all gained at least a pound over the last week. I am definitely starting to get a good workout carrying them in and out. 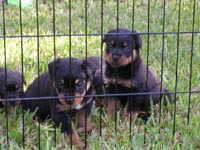 They are getting too smart; they know when 9:30-10:00 is and will start barking and whining until I take them outside. Once they are outside they run around and play for awhile and then fall asleep before their lunch. 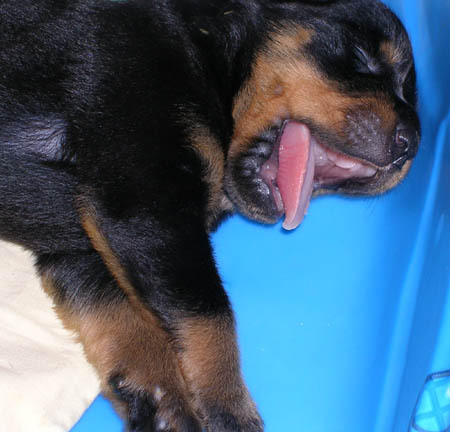 After their lunch they fall back to sleep and then start whining to go back in about an hour later. They are now playing more with the toys. One of them loves to carry around a pink cat ball. 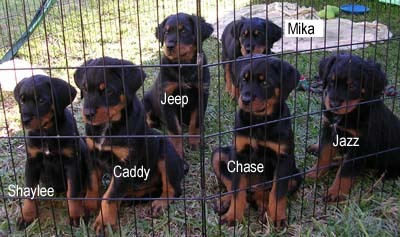 Alot of them now play tug-a-war with each other. Sometimes with toys but they love it with the towels. They all know the sound of the doors now. As soon as they hear any of them, they all jump up to see who it is. Of course they all do it at once if I don't have the camera. The shot below is the best I could get - 6 up there at 1 time. The littlest girl is finally able to get up there - can you tell which one she is? 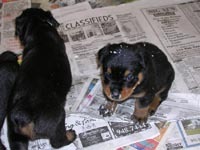 Monday 11/28/05: Puppies are 5 weeks old. 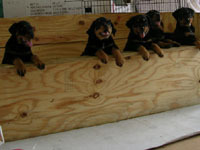 On Saturday, they were all weighed and given de-wormer. 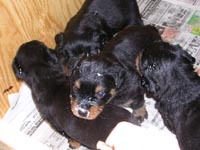 Their weights were 1 Male 6 lbs, 2 Males 5.5 lbs, 1 Male 5 lbs, 2 Females 5 lbs and 1 Female 4 lbs. 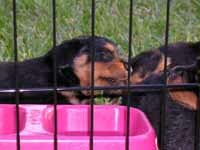 They go outside 1-2 times a day to play and eat in the x-pen. 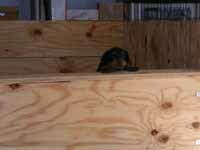 Sonja still keeps a watchful eye on me as I move the puppies back and forth. Now that Sonja is only nursing a little each day, she is starting to put on some noticable weight. The puppies are very alert to everything around them now. They seem to play a little longer and rougher now. 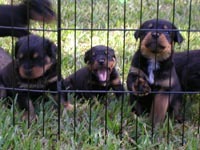 When they are playing I hear fiesty barking and growling. 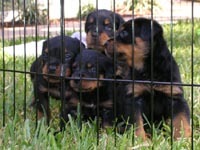 They cry when they hear my voice and will jump up on the edge of the pen and peer over. I try to pick up each one multiple times a day and slightly squeeze it's toes. 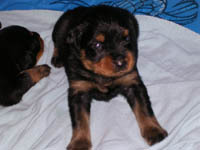 They are starting to all have a diffent look about them so most of them are easy to pick out. There are still a few I get confused with. 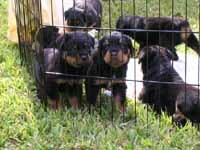 Thursday 11/24/05 (Thanksgiving): Puppies are 4.5 weeks old. 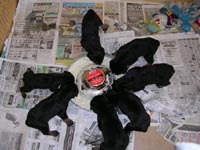 They are up to 3 meals (Nutro Puppy, Gerber rice and goat's milk) a day and loving it. They now know that I bring the food. I swear they recognize that food dish. They had their lunch outside and then plopped down in a pile to sleep. 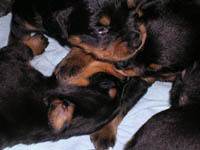 Sunday 11/20/05: Puppies are 4 weeks old. 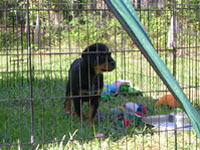 They are walking really well now and playing with each other as well as the toys that are in their pen. 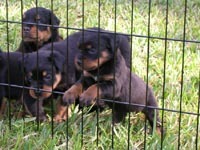 I love watching the little rottie butts as they walk around. 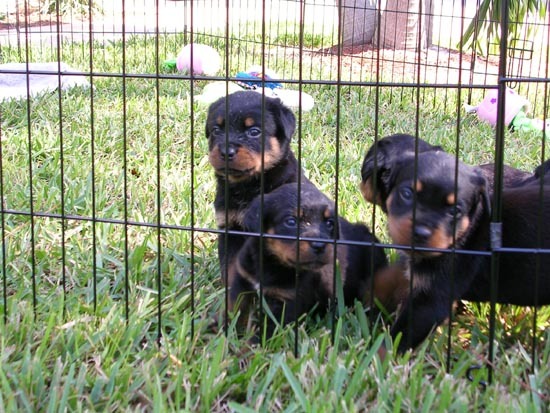 They look like minature bears. Today they got first real meal made of gerber rice cereal, goats milk and a little beef baby food. They needed no encouragement to eat - they literally dug right in. 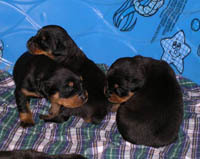 Thursday 11/17/05: Puppies are 26 days old. They are starting to run (a little awkwardly) and they can backup real fast. I noticed one of the pups wag it's little tail the other day. 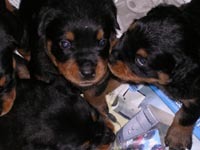 Their teeth have now started to erupt and they are playing more rambunctiously (jumping on each other, growling and barking). They can see and hear pretty good now. They wake up at the sound of the screen door or the sound of my voice. When they hear either one, they all come running toward me. 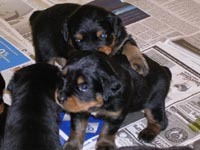 Each one gets picked up, cuddled and a kiss planted on their little face. A few will even give me a kiss back. 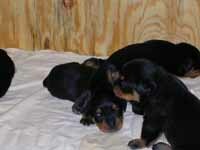 Sunday 11/13/05: Puppies are 22 days old. 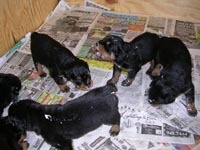 They were all weighed today and range from 2 to 3.5 pounds each. It is amazing how much they have changed in the past 36 hours. They are much more alert to the world around them. 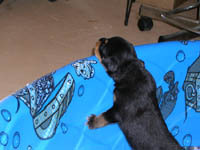 A few of them decided that they didn't want to stay in the kiddie pool anymore and preferred to sleep on the blankets around the outside. 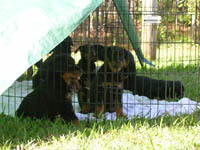 They are now in a 4' x 8' pen with higher sides than the pool. So far they have not been able to get out of this area. 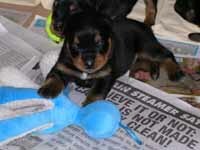 Sonja is now starting to discipline the puppies. It was very easy to figure out - it was the first time I had ever heard this sweet girl growl. 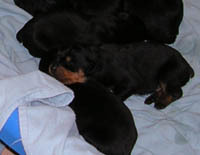 Friday 11/11/05: Puppies are 20 days old. They can now hear. I made the mistake of squeaking one of Sonja's toys yesterday and all the puppies woke up, came right over to the sound and started crying for mamma. Sonja looked at me as if to say "Now look what you did". 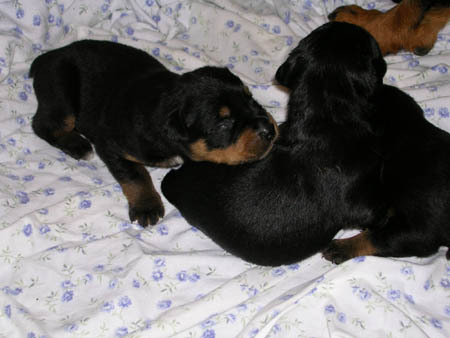 The puppies now seem to try to play with each other. They bite each other's heads and paws. 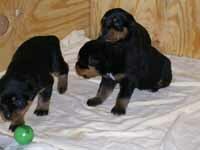 More of the pups are barking and giving out little growls. They are still too young to know what it means and they almost seem surprised when the sound comes out of them. 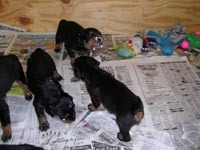 Tuesday 11/8/05: Puppies are 17 days old. 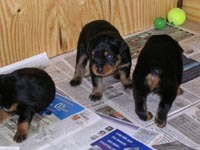 The puppies move a little faster on their feet today. 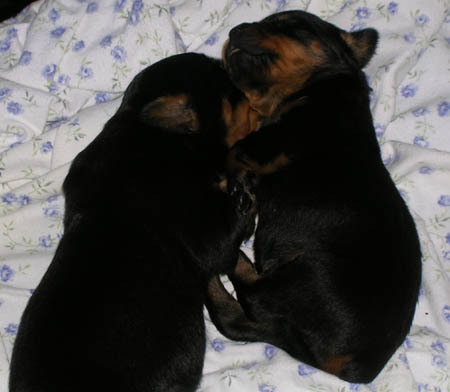 They still have only short bursts of energy before they all plop down into piles and fall asleep. I swear they look bigger than yesterday. kiddie pool faster than I thought. 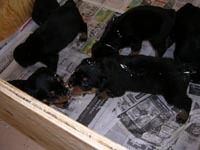 Monday 11/7/05: Puppies are 16 days old. 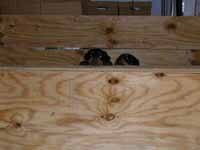 The puppies now weigh 2-2.5 pounds. Their eyes are open and most are getting around up on their legs instead of creeping. 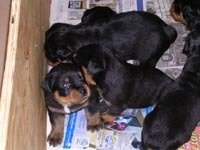 They still sleep alot so it is hard to get good pictures unless Sonja gets in with them. Then they all scramble to get to her. 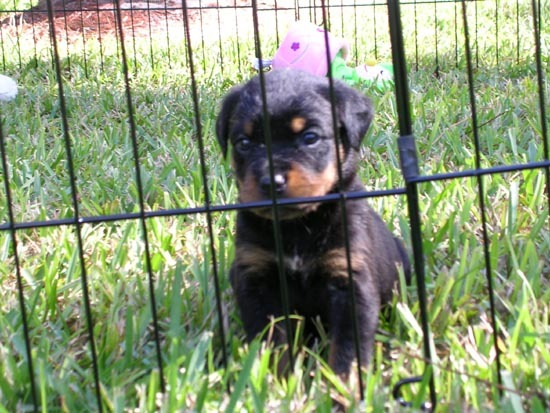 This little girl started barking today. 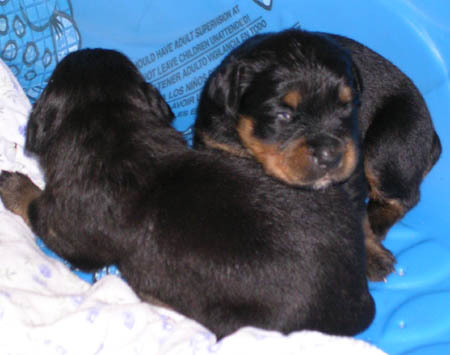 Thursday 11/3/05: Puppies are 12 days old. 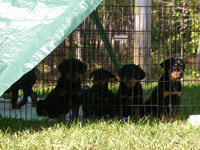 Sonja and her 8 little moose's have been here for 6 days and have settled in comfortably. She is now eating 4 meals a day and seems to be feeling pretty relaxed with a little more energy. Her and her kids are living in our garage which is completely screened across the front. If we have an exceptionally hot day there is air conditioning available for her. From her area, she is able to lay in the sun or shade and watch the squirrels run up and down the trees. If the squirrels get too close to the garage, she barks and wants to get out to chase them. This a very different Sonja than she was last weekend. 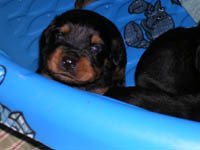 Today, Sonja and I moved all the puppies from the crate into a large kiddie pool. She had to inspect each puppy as I moved it. Here are some pictures right after I moved them. They never even woke up. Right now all they do is sleep and eat. I keep checking to see if any of them are trying to open their eyes. I haven't seen any yet.